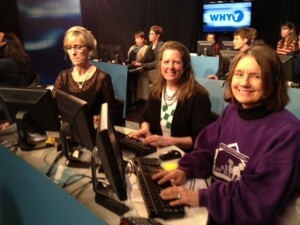 Montessori Children’s House was honored to be invited to join WHYY on Wednesday, March 5, 2014. Nona Melnick, Principal of the Horsham Montessori Children’s House joined 20 other Montessori educators from Pennsylvania and Delaware who volunteered their time from 5:30pm-11pm answering phones and taking pledges. At Montessori Children’s House, children are taught the importance of giving back to the community in which they live. Through various food and clothing drives and services projects, Montessori Children’s House is proud of their contribution to the Horsham community. "My children LOVE coming to this school! My daughter wakes up on the weekends and asks me to give her “hard work.” The concept that work is fun, and that she embraces challenges comes from MCH, and her excellent teachers."